In my first installment of Fridge Foraging, I made creamy prime rib soup, venison tenderloin with chimichurri, and pumpkin spice farro breakfast porridge. Welcome to my Fridge Foraging series! Each month, I will be sharing some of the meals that I’ve made using ingredients I have in my refrigerator, freezer, and pantry that need to be used up. Whether it’s giving new life to leftovers, using up that piece of meat waaaay in the back of the freezer, or making a delicious dinner out of seemingly nothing, it’s my hope that this series will inspire you to get creative with the food you already have in your kitchen. This not only helps you reduce food waste, but also saves you a trip to the grocery store, and maybe a little money! With just a little creativity and confidence, you can truly make some amazing things out of all the food you already have. 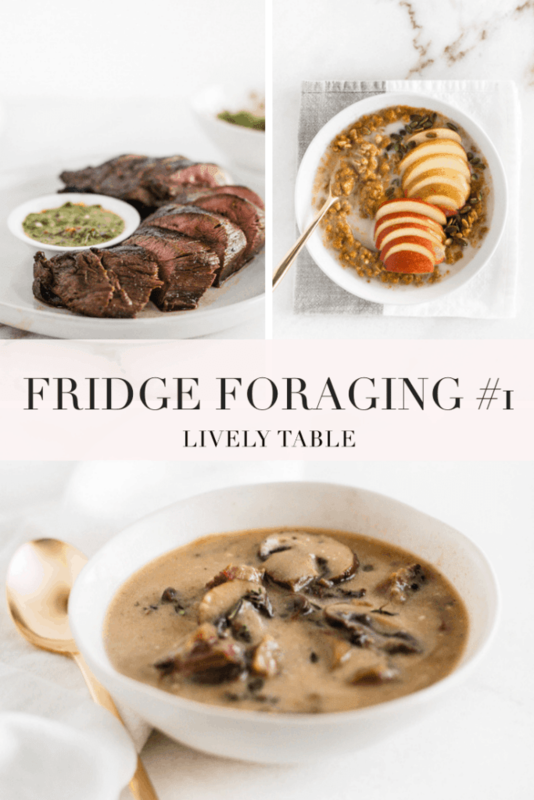 I treat it like a little game or challenge in my house, and I hope you’ll come to enjoy practicing a little fridge foraging, too! 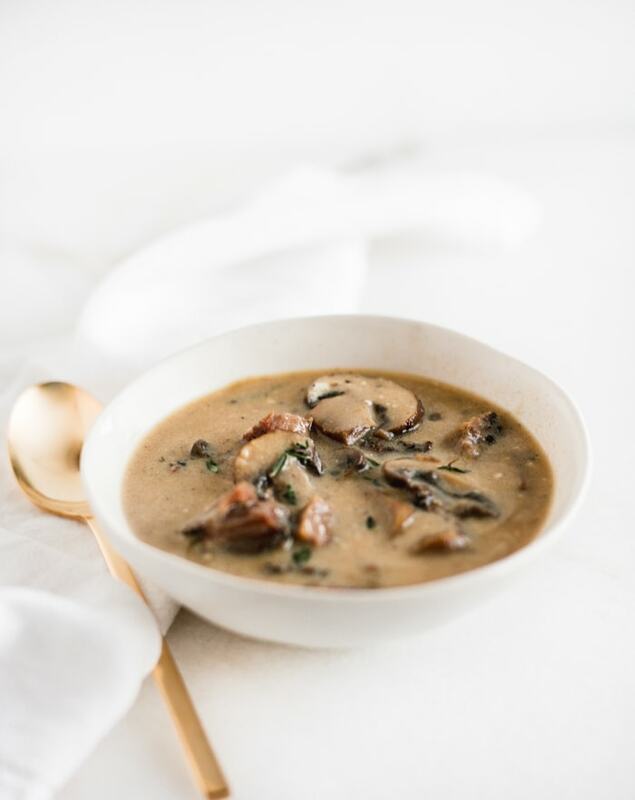 We had a little prime rib left over from New Year’s, so instead of drying it out by reheating it in the oven, I turned it into a luxurious, creamy soup with mushrooms (and no cream, actually!). I used tempered Greek yogurt to make the soup super creamy and delicious, because that’s what I had. You can use sour cream, if that’s what you have on hand. The key to getting a smooth, creamy soup that doesn’t curdle is turning the heat off of the soup, then tempering the yogurt by adding a little bit of the warm broth to the yogurt before adding it to the soup to warm it up a little. If you need to heat the soup again, don’t bring it to a full boil. Heat 1 tsp olive oil in a Dutch oven or large pot. Stir in 2 cloves minced garlic, half of a diced onion, and half of an 8 oz container of sliced mushrooms. Cook it down for about 5 minutes. Sprinkle the mixture with 2 tbsp flour (I use white whole wheat. Use any kind you want), salt (I used roasted garlic salt for extra flavor) and black pepper. Stir. Add about 1/4 cup red wine and deglaze the pan (scrape up the brown bits). Add about 2 cups beef broth and 3 cups leftover cubed prime rib. Cover and simmer until warmed through. Turn off the heat. Temper yogurt with a bit of the warm broth, then stir all of the yogurt into the soup. When we have venison in the freezer, it tends to get pushed to the back and forgotten about. But the venison tenderloin is not something to be wasted – it’s a fantastic piece of meat! I like to marinate it in a simple balsamic vinegar marinade and then pan sear it or grill at high heat. I had a lot of herbs ready to go bad on me, so I made a chimichurri sauce to go with it and served it with some smashed potatoes and maple dijon roasted carrots because again, the carrots were on their way out. Marinate venison tenderloin in a mixture of balsamic vinegar, worcestershire sauce, and black pepper. Sear tenderloin on high heat in a preheated cast iron skillet, then place the skillet in the oven at 400°F for 5 minutes. 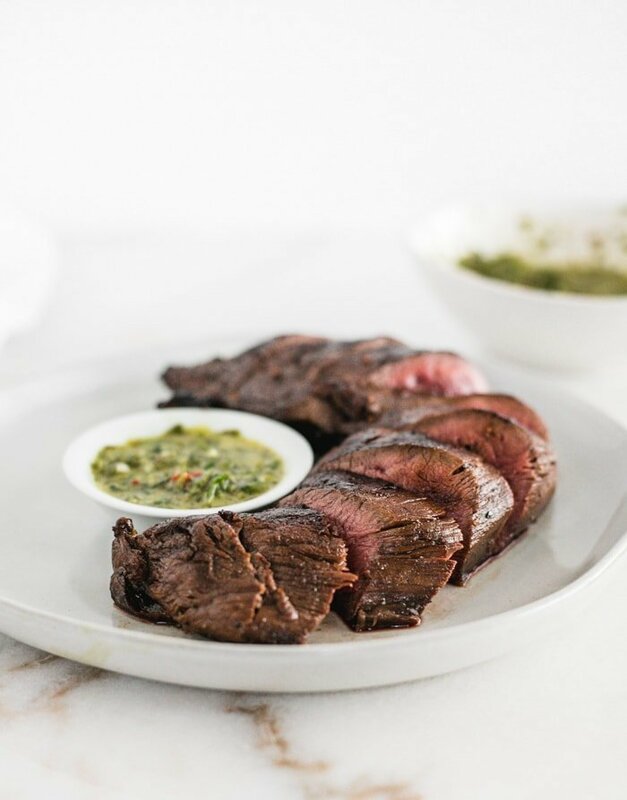 Rest, slice, and serve with chimichurri. I typically eat oatmeal in the morning, but I had leftover farro in the fridge that needed to be used, so I made a farro porridge like I would typically make oatmeal – with ground flaxseed for healthy fats and egg whites for protein. I decided on a pumpkin spice flavor since I have about 12 cans of pumpkin in the pantry (food blogger problems) and some pumpkin pie spice that I’d like to use up so it doesn’t sit in the cabinet unused until next fall – because spices do also have a shelf life. 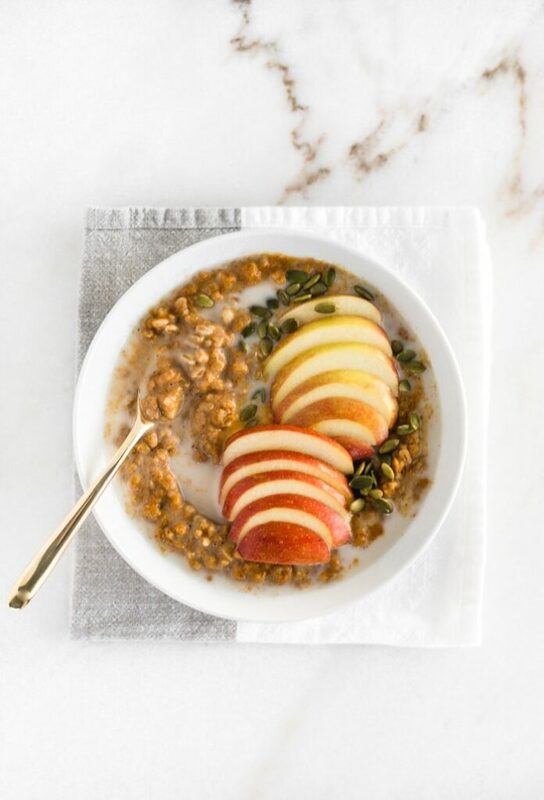 Breakfast porridge is a great way to use up all kinds of whole grains, not just farro! Place 1 cup cooked farro in a saucepan with a splash of almond milk. Bring to a simmer. Stir in 1/4 cup canned pumpkin puree and 1 tbsp ground flaxseed. Cook until heated through. Turn off heat and quickly stir in a splash of egg whites from a carton (or 1 beaten egg white). Stir in about 1 tsp pumpkin pie spice and 1 tsp maple syrup. Pour into a bowl and top as desired. I added apples and pumpkin seeds. What can you make from only the ingredients in your refrigerator, freezer, and pantry this month?